« How Fast Can This Thing Go? This year we reacted the anthracene diene with two different dienophiles in addition to the classic maleic anhydride. The Bruice Organic Chemistry textbook has the Diels-Alder reaction in Chapter 7 which is pretty early for most textbooks. The two new dienophiles were N-phenylmaleimide and Z-diethyl maleate. It turns out there are at least four maleate esters available from Sigma-Aldrich – E & Z dimethyl and E & Z diethyl. The reactions seemed work well by refluxing in xylenes for 45 minutes. As far as I am aware, the reflux time for the reactions has not been optimized. The reaction may not take this long to occur. After recrystallization from acetone, the three different dienophiles gave products that had quite different crystalline appearances – maleic anhydride yielded dull tan amorphous crystals, N-phenylmaleimide produced tan very light fibrous structures, and Z-diethyl maleate gave shiny white flakes. 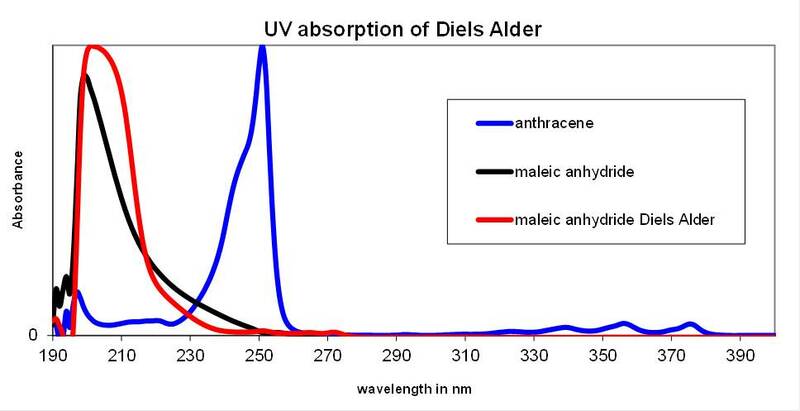 The expected Diels-Alder adduct was difficult to detect with TLC, UV, and IR analytical methods. The products did not show up very well on the TLC plate under UV light while the residual anthracene gave a very bright spot. The UV shapes of the products are very similar to those of the dienophiles and again the residual anthracene tended to show up quite prominently. The product IR spectra were difficult to distinguish from the starting materials because the only different functional group that is generated by the reaction is a sp3 methyne (tertiary) carbon. Bottom line – it was much easier to tell that the desired product was formed by observing the physical appearance of the products than by three common analytical techniques. This entry was written by jbfriesen and posted on January 1, 2011 at 11:22 am and filed under Uncategorized. Bookmark the permalink. Follow any comments here with the RSS feed for this post. Post a comment or leave a trackback: Trackback URL.